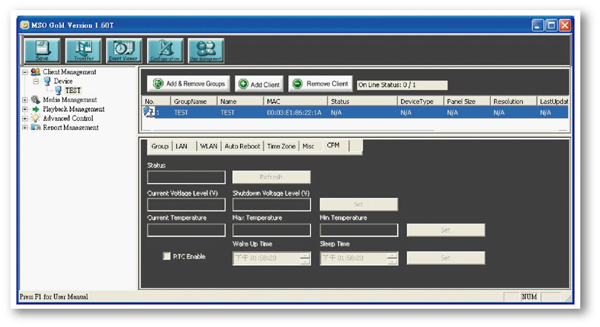 CPM has a build in Microcontroller, power Electronics, timer and Status LED's, but the heart is the Software inside, that allow flexible, remote controllable actions for protecting your Equipment. 1.CPM is watching the temperature with the thermal sensor, if the Temperature is to hot or to cold, the LCD's will be powered off, while the Player is still working. This is typically in a temperature range of 0 to 40 degree Celsius. So CPM will protect the lifetime and stable operation of the LCD's within the allowed temperature. 2. 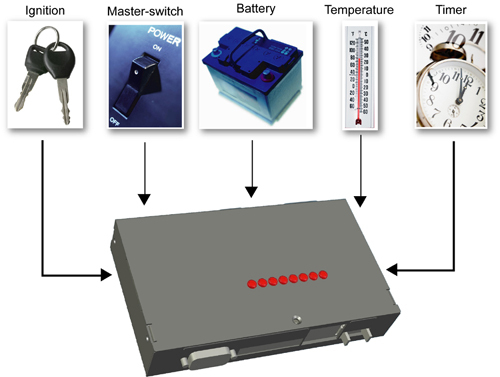 CPM is watching the Battery voltage level, and can make sure, the Battery will not be deep discharged. So in case the Engine is off, you maybe still want to play for 10 min,.. As its just a bus stop,... so your guests will keep watching your program,... but if its longer then 10 min,.. The LCD's will be powered off,... to save power,.. And make sure the battery is not discharged too much. 4. CPM can be controlled with the Ignition of the Engine,.. To delay power on,.... delay power off,... delay LCD's aso. Its all up to you how to use it. 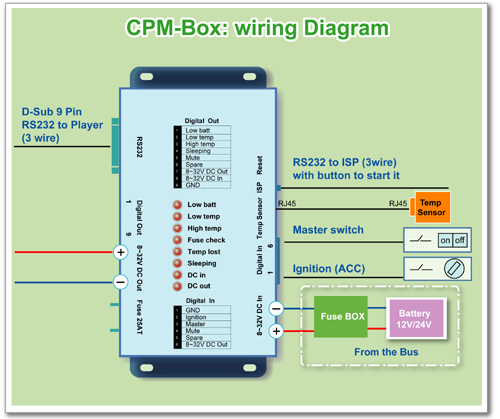 CPM is easy to wire,... just put it in between the 12 or 24V Battery power cables and the Bus Bundle Player & Bus Bundle LCD's and Connect the RS232 cable to the Player,... If you wish to use the Ignition and Master switch, just connect it . 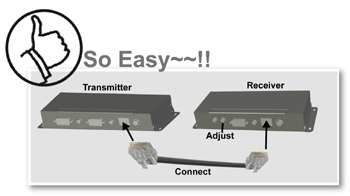 The CPM is very rugged and can operate from -40 up to +80 degree, and ensure the safety of the Bus Digital Signage Equipment. Also the small dimensions makes it easy to install anywhere in the bus. The status LED's in the top are easy to see and indicate the status in different colors for example: green is ok and red is problem, please check. Do you know this problem? 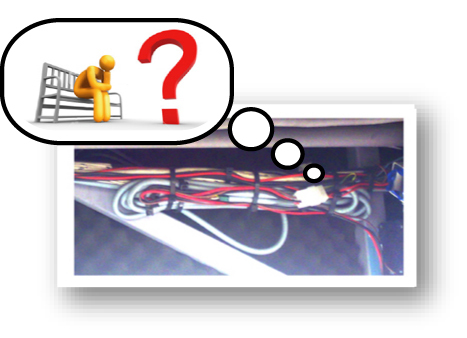 Thick and expensive VGA cables, poor quality VGA Splitters, problems with the Power source...? 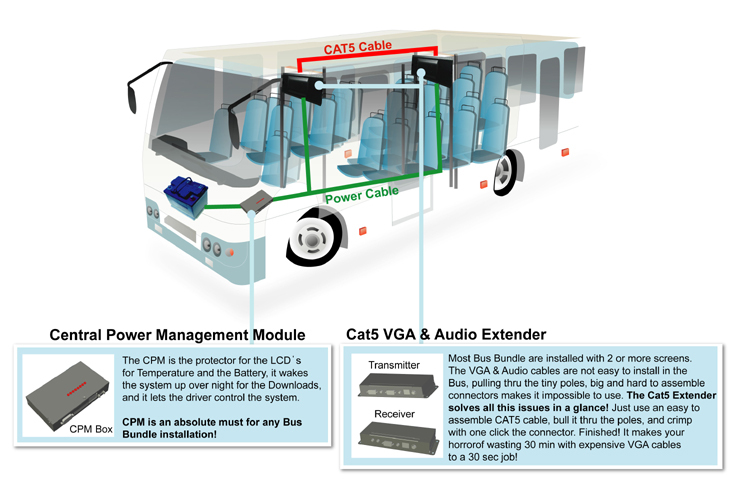 Not with Winmate's total solution platform for Bus Bundle - we took care all of this and made a smart CAT5 extender option for you!